Sitting in the back seat of the car her husband was driving, Brynn Parrott Chatfield’s entire field of vision was filled with flames as she prayed. Only the thin strip of road in front of them remained unburned. Shades of orange, white, purple and pink burst out on both sides, hundreds of small fires all burning at the same time, low on the ground and up and over the trees. A wave of embers rose up from the surface of the road and struck their front windscreen. Brynn’s husband Jeremy drove calmly on down the middle of the road; no-one would be coming towards them into the fire. By now, no road was visible, and only a dense orange cloud could be seen in front of the car. Then suddenly, it cleared, and the fires seemed to scatter. Clear skies opened up, the last embers bounced off the windscreen and the fire was finally behind them. As a helicopter flew overhead, carrying water to try and douse the flames, Jeremy and Brynn knew they had made it out alive. Soon after, almost nothing would remain of their hometown, Paradise, and the fire they fled in north-east California would become the deadliest and most destructive in the state’s history. This is the story of how the fire spread. It is known, simply, as Incident No: 181108-9002. The incident report, logged by the utility company, Pacific Gas & Electric, shows that damage occurred at this time in a power line outside the small community of Pulga. This significance of this is not yet clear, but it may prove to be the spark that lit what became known as the Camp Fire. PG&E have since begun co-operating with investigators, and point out that no cause has yet been determined. But the company had warned a day earlier that it might turn off power in the area because of strong winds expected on the Thursday. In the end, it decided not to do so “as weather conditions did not warrant this safety measure”. A lawsuit has already been filed against PG&E, alleging negligence and health and safety code violations. The California Department of Forestry and Fire Protection (Cal Fire) reports that a wildfire has started outside Pulga, about three miles north-east of Paradise. Staff at the Adventist Health Feather River Hospital in Paradise, about 25 miles from Pulga in the foothills of the Sierra Nevada mountains, are warned that the Camp Fire is getting close to town and that they should evacuate their patients. One nurse, Tamara Ferguson, is carrying out checks on new mothers in the maternity ward alongside a new trainee. She spots an orange glow out of the window and steps outside with her colleagues. As they look up at the sky, ash starts to fall like snow. She and other hospital staff, including surgical nurse Karen Davis, begin to move the hospital’s 67 patients into any vehicle they can find. Sorrell Bobrink is waking up at home in Paradise when she receives a phone call from a friend. Her friend is in Oroville, some 20 miles from Paradise down in the Sacramento Valley. From her house, she looks up towards Paradise and sees flames, and worries that Sorrell might be in danger there. Within eight minutes of the phone call, Sorrell is hosing water on to the roof of her home of two years, before turning on sprinklers. It won’t be enough to save her house. Sorrell picks up whatever clothes she can, leaving behind all items of sentimental value: her midwifery books, the notebook her mother put together aged 21. She puts her son, cat and dog in the car and, before leaving, grabs a cup of coffee from her kitchen counter. Having made his morning coffee, William Hart steps out of his home in Paradise and notices the darkening grey-brown sky. His first reaction is not that a wildfire is on its way. He finds his bag – still unpacked since he moved into the house six days earlier – and his housemate picks up the urn that carries her late husband’s ashes. The sky over Paradise is by now a deep sepia as the smoke starts to blot out the sun. Within 10 minutes, it is as though night has fallen. The only lights are those of the cars trying to make it out of town, but much of the traffic has ground to a halt. Ash falls on Paradise at a rapid rate. His is the last car in the queue leaving Paradise as the flames close in. As she tries to leave town, nurse Karen Davis’ vehicle breaks down. Karen calls her daughter Wendy, who can hear the sound of heavy items falling on the car, and a crackling noise over the line. “It’s getting really hot. I can’t breathe,” Karen says. Karen steps out of her vehicle, hitches a ride back into Paradise and heads towards her hospital again. Nearby, another nurse, Tamara Ferguson, is in an ambulance leaving town with a critically ill patient and other staff. Over the radio, they hear that one of the ambulances ahead of them has caught fire. They pull over and realise they can’t make it any further, and hear the small blasts of transformers exploding around them. Looking at the only house that is not burning, they decide to shelter with patients inside its garage. Tamara and her colleagues start stripping away loose vegetation from near the house to try and stop it catching fire. Others spray the roof and start stockpiling water as the fire gets closer. The flames grows bigger around them, and cars become caught in gridlock. Tamara calls family members, telling them how she loves them, how sorry she is for mistakes she may have made. She asks her eldest daughters to look after their youngest siblings. When she finally makes contact with her boyfriend, he tries to calm her down and tells her to breathe slowly. “Babe, there’s no way I’m going to survive this,” she replies. Sorrell Bobrink, her son, cat and dog are moving north out of Paradise, but the fire creeps ever closer into the road, reducing it from a five-lane highway into one with two lanes, and slowing traffic just as people want to move more quickly. Sorrell knows that each decision she makes could be fatal. She knows there is a section in the road up ahead that is not surrounded by trees. But with little around her to help her get her bearings, she doesn’t know how close it is. So she fears she may be driving herself and her passengers to their deaths. Instead, she makes it out. So too do the nurses, who return with their patients to the Adventist Health Feather River Hospital in Paradise, despite the fire getting closer there. Emergency crews carry out triage on the patients who need it, and Tamara Ferguson helps treat two women who have just undergone caesarean sections. As the fire creeps towards them, staff move patients as high as they can, up to the hospital’s helipad, which fills with wheelchairs, stretchers and blankets. Eventually, they all manage to drive away to other hospitals in the region, leaving just as the fire starts to consume their own hospital. “I looked out the back window at the devastation, while I conversed with the sweetest 95-year-old woman,” Tamara later says. 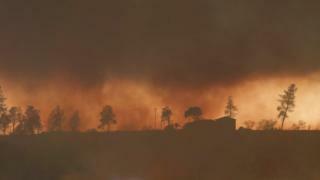 “We watched the flames beside us, burnt cars in the road, power lines down and fresh homes burning. It went on for miles. Car tires pop around William Hart as they succumb to the fire. Along the way, he picks up a passenger and two abandoned dogs, who sit on his back seat as he records his journey on his phone. William passes the charred remains of other dogs, and some which he believes are human. He can’t look at the footage, and deletes it, then keeps driving for hours once the fire is behind him. 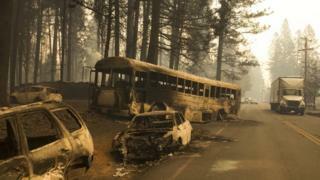 At least 79 people were killed, many as they became trapped in their cars as the fire surrounded them. 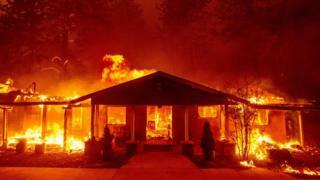 Within only a day and a half of it starting, the Camp Fire destroyed more properties than any other fire in California before it. Those are the words, according to local legend, that led to the small mill town gaining its name in the 1860s. William Leonard and his crew are said to have just returned from delivering lumber to a mill when he sat down underneath a pine tree, looked out at the view, and spoke those words. Over time, Paradise grew to be a bucolic town of 27,000 residents, known for its cooler temperatures and slower pace of life among the trees. 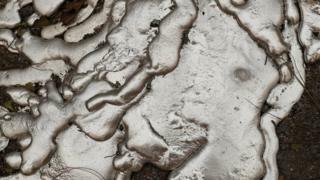 There was the Gold Nugget Museum, that talked of the Native American prospectors who first settled the area. There was the Black Bear Diner, with its all-day breakfasts and friendly sign (“Welcome to Bearadise”). But there were also those pines, the ones that William Leonard sat under in the 1860s, and the ones that played their part in the destruction of the town. 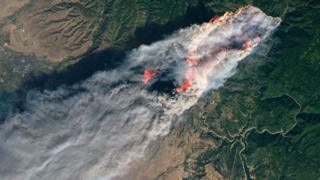 Conditions in California mean that if a wildfire ignites, it can spread at speed. The state has suffered especially dry weather recently, and California Governor Jerry Brown has acknowledged the role man-made climate change has played in making those conditions worse. This would be bad enough in itself, but the powerful winds – warm, dry air travelling from the east to the coast – have turned vegetation into tinder across the state. Areas like Paradise, which is at the bottom of mountains over which the winds barrel down, are especially at risk. Those winds helped whip up the Camp Fire and led it to jump canyons, roads and emergency fire-breaks that had been dug to try and stop the flames spreading. 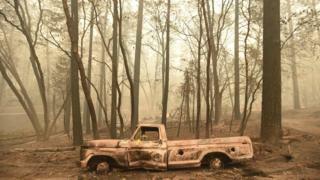 On the morning the Camp Fire swept through Paradise, there were gusts of up to 55mph. “It was just so fast,” Sorrell Bobrink says, still unable to understand how things got so bad, so quickly. 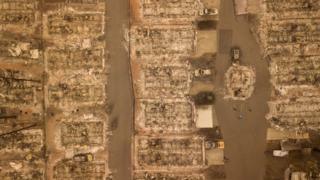 A map of damaged properties in Paradise shows strange streaks, isolated pockets where the fire flashed by and left little damage. In some neighbourhoods, one house would remain standing while all others around were destroyed. A rubber duck stood untouched even though the house in which it once sat no longer existed. While almost all of the interior of one shop was incinerated, cardboard boxes holding gas grills were left barely burned. Houses that suffered no damage at all are few and far between, however. 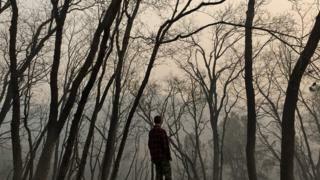 So far, the Camp Fire has destroyed close to 12,500 properties and 151,000 acres. Ten days on, it continues to burn and it is unlikely to be fully contained until the end of the month. As Paradise was lost, and two other large wildfires spread in southern California this week, Gov Brown said he refused to accept this was the new normal. “This is the new abnormal,” he said. 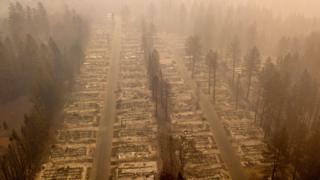 But in interviews, Camp Fire survivors would often cite other fires they or relatives had survived in recent times – the Carr Fire, the Thomas Fire, the Tubbs Fire, the Mendocino Complex Fire – each different in its own way, but which together signify a new sort of threat California must learn to live with. Survivors are now scattered across the state – some in Red Cross camps, some in a temporary tent city that has popped up in the car park of a Walmart store in nearby Chico. Meanwhile, relatives of the roughly 1,000 people who are still officially listed as missing are now being asked to give DNA samples so police can match them to any remains that are found. Police dogs trained in picking up the scent of bodies are being taken through the piles of ash where houses once stood. “I will forever be changed, as so many thousands of others were,” Tamara Ferguson says.